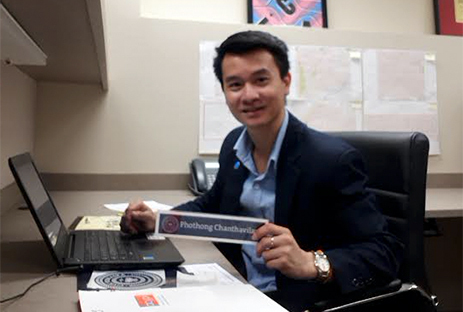 Johny is with Civic Nebraska this fall via the American Council of Young Political Leaders Professional Fellow Program, which is a part of the Young Southeast Asian Leaders Initiative. Sabaidee and hello everyone, my name is Phothong Chanthavilay. You can also call me “Johny.” I’m with a fellowship program called The American Council of Young Political Leaders Professional Fellow Program, which is a part of the Young Southeast Asian Leaders Initiative (YSEALI). I have been attached during my four-week fellowship program with Civic Nebraska. I think I am very friendly, sincere, trustworthy, and open-minded. I enjoy making friends and I value the friendships and relationships I make. I realize that we all are unique and different, and that we don’t need to be the same. No one has everything, but everyone does have something. Here are five things about me. 1. Who am I? I am a lecturer at the Department of Social Work and Development, Faculty of Social Sciences, National University of Laos (NUOL). Yes, I am a teacher, a trainer, a translator/interpreter, researcher, and development practitioner. I graduated a Bachelor of Sociology and Social Development from NUOL and Master of Development Studies from Victoria University of Wellington, New Zealand. 2. What am I doing in here? Part of the fellowship program is to develop a project to implement in my home country upon my return. My project is focusing on youth leadership and critical thinking development (two areas in which Civic Nebraska specializes). The project aims to help improve leadership and critical thinking skills for university students, especially those who are in the Department of Social Work and Development, Faculty of Social Sciences. 3. What are my impressions in Lincoln, Nebraska? I have enjoyed my time here so much. It’s such a nice and lovely city – people are very kind and welcoming. Impressions of Civic Nebraska, my fellowship host organization, is incredibly touching for me. The welcoming atmosphere made me feel comfortable and happy to learn from them. (Executive Director) Adam (Morfeld) and (Assistant to the Executive Direcotr) Jules (Ward) have done a great job in helping me learn and experience a variety of helpful things for my project and my professional development, as well as connecting with other related partners and organizations. It has been a great opportunity and I thank them for having me. 4. A little bit about my home country, Laos. I am from a small, landlocked, but happy country in Southeast Asia. I would say that generally Lao people are very kind-hearted and welcoming. The country itself is also very beautiful and charming. There are so many places to visit and so many things to experience such as the World Heritage City Luang Prabang, Vientiane Capital, Vangvieng, Pakse and so forth. Please do let me know if you have a chance to come and visit my country, I am more than happy to welcome you. 5. Why am I called “Johny?” My parents have used ‘Johny’ as my nickname since I was a baby. It’s from Johnnie Walker — but it’s not because I like drinking it so much, or that my parents do. I am the first child in my family born on Dec. 24 and my parents were very happy and excited to have the first child and name him. One day there was a ceremony (and celebrating party) for the newborn baby and there were many people coming into my house. They brought a lot of Johnnie Walker with them! They all had a lot of fun — no one could go back home that night, so they just slept on the floor. My parents called me “Johny” from then on, because it brought everyone together to have such a happy time.